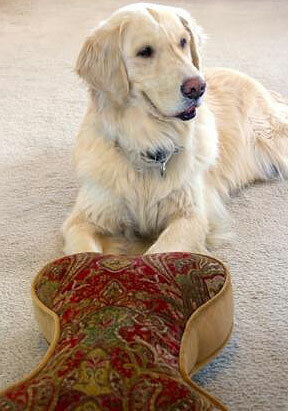 Since 1998, Bowsers has set the trend in distinctive, quality pet products. Their line combines superior quality materials and great design. Bowsers products are developed not only for great comfort and durability, but to compliment the home decor. That is why we love them so much. Yes, you can find many pet products at discount chains but they are typically made overseas and the quality is sorely lacking. Having been a dog lover for many years, we have often found out the hard way that investment in a few well-made products pays for themselves over time. 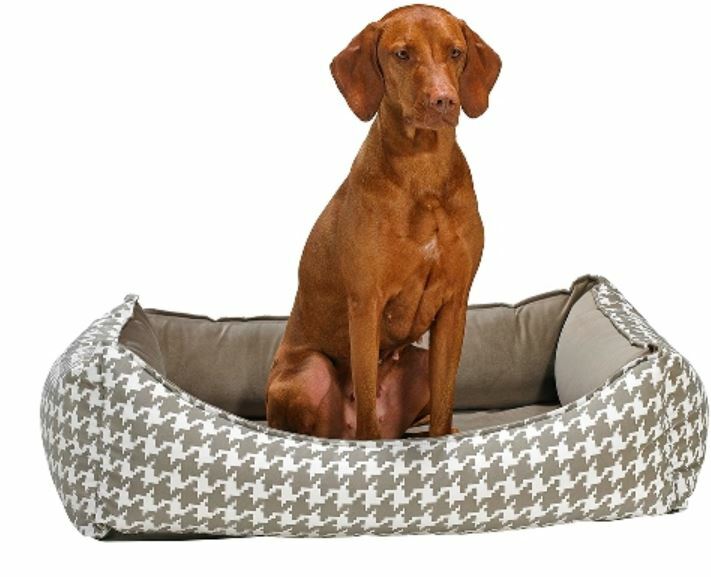 We like products to outlive our beloved dogs, not the other way around. Oh, by the way, if you are wondering who this adorable Golden is, meet Nevada. Nevada is modeling Bowsers' bone-shaped Sofa Toss Pillows. Mom Jodi just raved about her pillow and said that it was so luxurious in person. We love when folks are pleasantly surprised by the quality from this great Canadian company. High quality with zippered covers sporting YKK zippers used in the luggage industry, high memory virgin polyester fiber and Eco-Tex Certified upholstery grade fabric. Microvelvets ― Although all of the Bowsers fabrics are furniture weight, the strongest fabrics are the Microvelvets. These fabrics are constructed with nylon making them 6 – 8 times stronger than cottons. They stand up best to repeated washing and wear and maintain their great look and feel for years. Best of all, the Microvelvets get softer after every wash. Superior quality designer upholstery grade fabric. Made in USA. Repels pet hair, dirt and spills. Soft and luxurious. Breathable. Cool in summer and cozy in winter. Commercial machine washable and dryable. Color fast and non shrink fabric will look like new after every wash. Important Note: The manufacturer does not accept returns unless items are defective, or due to your receiving the wrong color or size from that ordered. This item ships separately, directly from Bowsers. Bowsers Pet Products only ship to the Contiguous USA and Canada. They are made to order so please allow up to 15 business days for shipment.